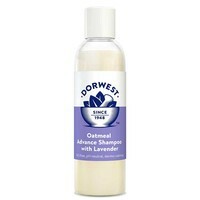 Dorwest Oatmeal Advance Shampoo for Dogs can be used to restore, moisturise and rebalance the skin’s quality. It can be used as regularly as needed for a healthy skin and glossy coat. Designed with a pH of 7 to work harmoniously with your pet’s skin, this hypoallergenic shampoo is a good option for those with sensitivity, as the soothing and hydrating oatmeal works together with the calming lavender oil to nourish and hydrate. For non-specific irritated, dehydrated or flake skin, bathing with this shampoo can restore, moisturise and rebalance the skin’s quality.